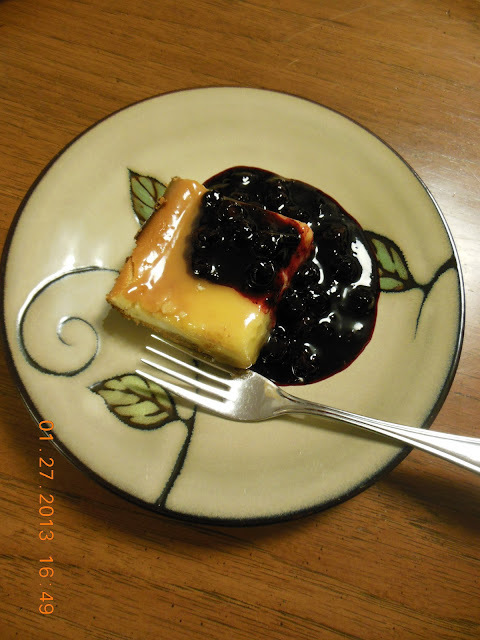 Lemon Cheesecake with Lemon Curd and Blueberry Sauce - Our Sunday Cafe, the Retirement Edition! For the longest time, I did not think I liked cheesecake. I understand that from a calorie point of view, not liking cheesecake might be a good thing. But my dear husband Terry is a serious cheesecake fan, having boasted a time or two that he ate 13 (yep thirteen!) pieces of cheesecake at a single sitting. But the truth is, I love cream cheese. It is creamy and tangy and rich. It seems I also love cheesecake, but not the traditional spring form pan and that particular presentation. It can also be a challenge to serve. Enter the standard 9X13 pan, coupled with the same wonderful cheesecake flavor, and an easy to serve bonus. 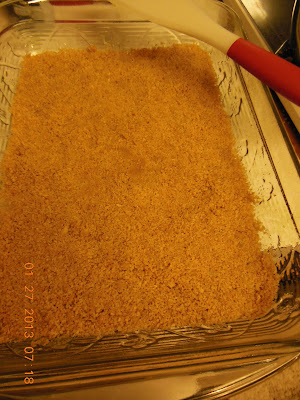 To make the crust, combine all ingredients, press gently into the bottom of a prepared 9X13 pan. Set aside. Beat cream cheese until smooth, beat in sugar, salt, and flour. Add eggs one at a time, mix in completely. 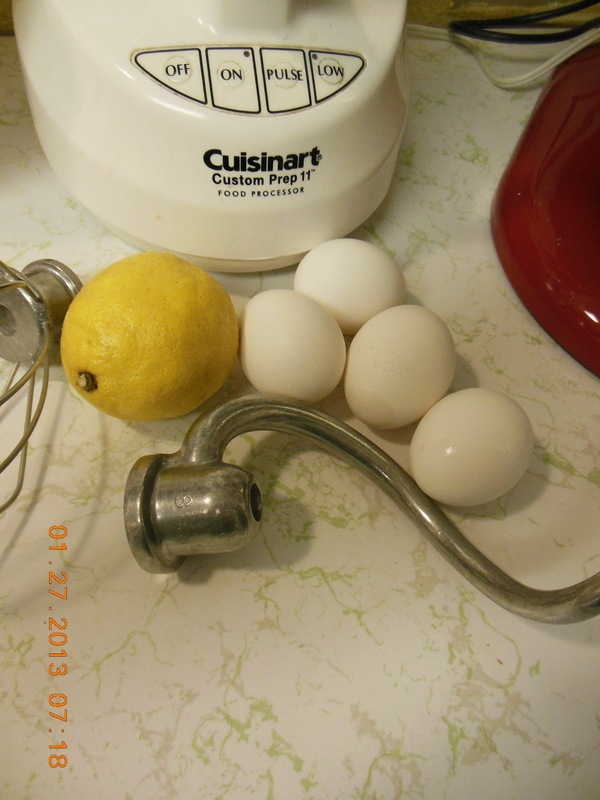 Add lemon juice, mix well, scrape bottom and side of the bowl, mix again if needed. Gently pour cream cheese mixture over crust. Bake 45-60 minutes or until done in your oven. Set aside to cool. When warm to the touch, spread with the lemon curd. Let cool completely. To make the Blueberry Sauce, combine the berries, sugar, salt, cinnamon and 3/4 c water. Bring to a boil, simmer 5 minutes. Stir cornstarch into the remaining water, until smooth. Add to the blueberry mixture, cook until thickened and transparent. Serve squares of cheesecake with blueberry sauce. This cheesecake sounds divine. 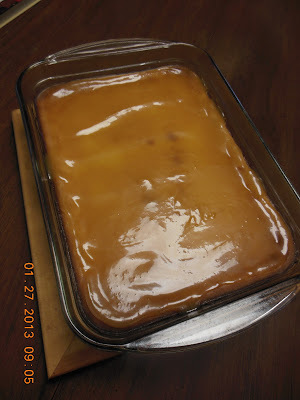 I love the idea of using lemon curd. And then of course, you must have the blueberry sauce. I'll be making this one! I love cheesecake, but don't eat it much because of the calories. Yours looks mouth-watering!! Your cheesecake looks delicious. Lemon and blueberry is such a wonderful flavour combination and their tangy sweetness is the perfect foil to cheesecake. I like the idea of having the lemon in the cheesecake and the lemon curd too, for layers of flavour. I like the idea of making the cheesecake in the rectangular pan too. This looks delicious! Thanks for sharing your recipe with the Hearth and Soul Hop. I’ve pinned it to my dessert board.